GPS Coordinates: 41 d 25'23.09" N 70 d 36'22.12" W elev 13 m - For Satellite Map click here! Special Note: Farm may open earlier and close later by chance. $5 pp admission from April 27 to November 1 annually, otherwise a $5 pp suggested donation is welcomed! For Special VIP Pass Options click HERE! You may also view our Workshop and Event Calendar for a current schedule. Other hours available by appointment, please call. Open rain or shine! Click here for current island weather. Please find two helpful posts of visitors to our farm, here, and another here! Please enjoy this following video of Martha's Vineyard! 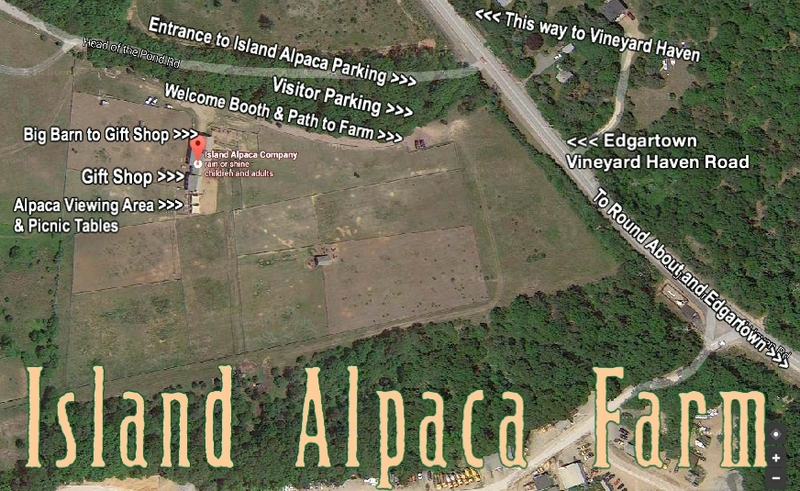 Island Alpaca is located just south of Cape Cod, on the Island of Martha's Vineyard, off the coast of Massachusetts. We are just 2 miles from the Vineyard Haven Steamship Authority Ferry, and the Fast Ferry and 4-1/2 miles from the Oak Bluffs Steamship Authority Ferry, and the Patriot Ferry in Falmouth. For Ferry travel information visit the Steamship Authority website. More information on traveling to the island below. From Vineyard Haven: From State Road take Edg-VH Road. Travel 2 miles and turn right onto Head of the Pond Road. Entrance is the first drive on the left (Look for Alpaca Avenue road sign.) Warning: Do not take a left onto Head of Pond Road; another road with a very similar name! Park and follow the alpaca signs to the barn! SPECIAL NOTE IN WINTER: If snow or icy conditions exist please park at the second entrance at the barn. Please leave all pets at home or in your car, with the windows open! 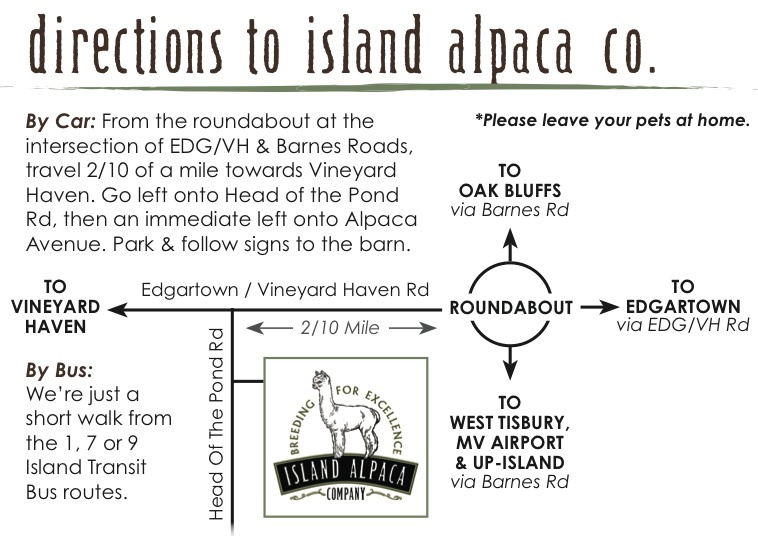 From Vineyard Haven: Take the #1 bus, and ask to get off at the alpaca farm, just before the roundabout... Walk down Head of the Pond Road and take the first left, just one minute away. From Edgartown: Take the #1 bus, and ask to get off at the alpaca farm, just after the roundabout... Walk down Head of the Pond Road, and take the first left, just one minute away. From Oak Bluffs: Take the #7 or #9 bus, and ask to get off at roundabout at the intersection of Barnes Road, and Edgartown/Vineyard Haven Road. Walk in the direction of Vineyard Haven on the Edg/VH road, and you will find Head of the Pond Road as the first left walking 2/10ths on the the left. Special Note: Image below shows incorrect name of the road. The correct name is Head of the Pond Road. Please be forewarned that a GPS may send you to the wrong street, one mile away, towards Vineyard Haven, on the opposite side of Edgartown/Vineyard Haven Road. Looking for something to do in addition to Island Alpaca Farm? Our Farm and Farm homes are close to many great attractions, activities, and areas of interest. Below are a few of our favorite things to do and places to go on the island. Please tell the following businesses that Island Alpaca sent you! South Beach (Katama) is three miles of barrier beach on the South Shore at the end of Katama Road. Fine surf on one side, protected salt-pond on the other is open to all. If you are looking for looking for a more family-friendly beach, check out State Beach in Oak Bluffs. Explore other beautiful beaches on the island. You don't have to be a kid to enjoy the oldest working carousel in the country. The challenge lies in reaching out to get a brass ring that entitles the winner to a free ride. There is also an arcade to keep the kids busy on a rainy afternoon. Nestled within the center of town of Oak Bluffs are over 180 small cottages. Take a stroll through town and see the intricate homes that are well-preserved. A trip to the cliffs is surely a treat on nice days, where you can see the multi-colored clay cliffs. You can see views of the Elizabeth Islands and towns as far away as Newport, Rhode Island are visible to the naked eye. 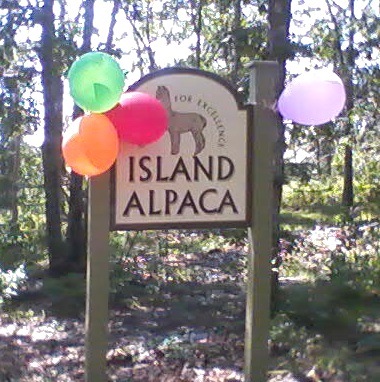 Island Alpaca is open daily, rain or shine, and is fun for all ages. Learn more about these extraordinary animals, take a self-guided walking tour, and watch an informative video-presentation. For only $5 per person (Memorial Weekend to November 1), it is a great place to bring the kids! 12 Circuit Avenue, Oak Bluffs | (508) 693-9151 | Also Locations in Vineyard Haven and Edgartown. Things to Do...other than Island Alpaca! The Trustees, a statewide land-conservation group, offers several fascinating 2 1/2-hour tours by safari vehicle or canoe around this idyllic nature preserve. The Natural History kayak tour on Poucha Pond and Cape Poge Bay is designed for all levels. There's also a tour of the Cape Poge lighthouse The trustees also offer 1 1/2-hour kayak tours around Long Point. In an intimate (112-seat) black-box theater, professionals put on a rich season of favorites and challenging new work, followed, on summer weekends, by musical or comedic cabaret in the gallery/lounge. Children's theater selections are performed on Saturdays at 10am. Townspeople often get involved in the outdoor Shakespeare production. Martha's Vineyard Film Society, Inc. Established in 2002 by Richard Paradise, the Film Society is member-funded arts organization dedicated to screening the best in independent films, movie classics, documentaries, and world cinema for diverse audiences of all ages throughout the calendar year, at various screening venues around the island. The Society also presents film-related speakers, educational programs and special events to enhance this main mission and increase the public's appreciation of fine cinema in all its forms. Farm Neck Golf Course is the only 18-hole public golf course on Martha's Vineyard, located less than five miles from our home. It features 6,807 meticulously-landscaped lawns. An Oak Bluffs, charter boat is Skipper/Vineyard Sound Charters, who take groups of up to 40 on fishing trips - good for first-timers or those who are more experienced. Location: On the bulkhead near the Island Queen, Oak Bluffs | Phone: 508-693-1238. A catamaran, the Mad Max Sailing Adventures, offers varied experiences for everyone. Take a scenic tour of the island from above! There are a variety of different locations to take in some of the nightlife entertainment on the island. Here are three of our favorites. Please tell the businesses that Island Alpaca sent you! Martha's Vineyard Fast Ferry-The largest, most luxurious fast ferry to Martha's Vineyard. Departing from Quonset Point, Rhode Island, it is the most convenient and time-saving way to travel to Martha's Vineyard! The closest Martha's Vineyard ferry to CT, NY, NJ & Western MA. Also Providence Airport & Amtrak Shuttle Service, dockside parking & advance reservations. Seastreak Ferry - New York City, New Jersey. Hy-Line Cruises - High-Speed ferry service from Hyannis to Oak Bluffs in 50 minutes, April through November. Traditional service from Hyannis to Oak Bluffs seasonally, May through October. Inter-Island service from Oak Bluffs to Nantucket, June through September. Passenger-only. Island Queen - Falmouth to Oak Bluffs, May-October, -Passengers Only, 35 minute trip,-The Island Queen is the only cruise ship sailing regularly from Falmouth Harbor to Oak Bluffs, centrally located, easy to get to, and with no hassle for parking. Falmouth Edgartown Ferry Service - Falmouth Edgartown Ferry "The Pied Piper" and "Sandpiper" are the only scheduled vessels from Falmouth to Edgartown and are operational from May through October. The 50 minutes trip brings visitors to the municipal wharf next to the Chappy Ferry in Edgartown's waterfront. Valet parking service is available at the Falmouth dock. Book reservations online, charters available. Patriot Party Boats - MV Water Shuttle between Falmouth-Oak Bluffs. Late night water taxi. Cape Air - Be there in minutes. Daily, year-round flights from Boston, Hyannis, New Bedford, Martha's Vineyard, Nantucket and Providence, Rhode Island. New seasonal non-stop service from New York. Discounts available for seniors and children. Voted Martha's Vineyard's favorite airline. Eagle Air- Year round charter flights to Martha's Vineyard from any airport in the country. Winter Aerial View of Island Alpaca Below! ** Below photo courtesy of Tim Johnson.